Happy Birthday Your Holiness the 14th Dalai Lama of Tibet, wishes from all over the World! A special video message by Tibetans and Supporters from around the world wishing His Holiness the 14th Dalai Lama on his 77th birthday. Students for a Free Tibet-India organised a special musical evening in dedication to His Holiness Dalai Lama by Tibetan people and supporters around the world on his 77th Birthday, the first one after devolution of his political powers to the elected leadership. The Return of His Holiness the Dalai Lama to Tibet Has been made by all the Tibetans who have immolated themselves since 2009. The cherished dream to get a glimpse of His Holiness in Tibet is shared by Tibetans inside Tibet where a mere possession of His Holiness’ pictures is a crime. 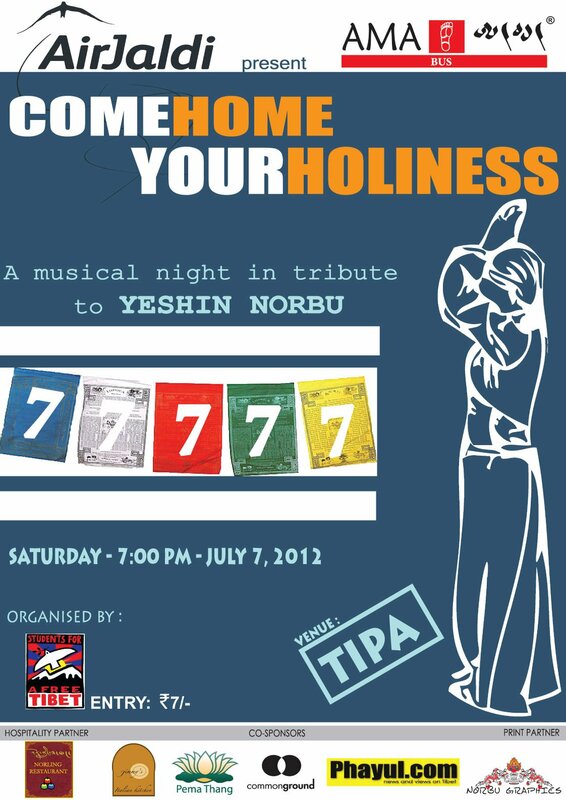 Therefore, we have kept the theme of our concert ‘ COME HOME YOUR HOLINESS ‘. Through this musical event, we are again trying to highlight the call of Tibetan people inside Tibet and our love and prayers for His Holiness’ long life. Pingback: Happy Continuation Day to His Holiness the 14th Dalai Lama « Namaste Consulting Inc.